Are you looking into an exotic Fiji vacation? Discover information on flights to Fiji to get you started for planning your relaxing holiday! - Where to I arrive? There are two international airports in Fiji. However most passengers will arrive into Nadi International Airport (NAN) which is situated 9km out of the township, Nadi. Nausori Airport (SUV) near the capital Suva, is used primarily for domestic flights with the occasional flight to neighboring South Pacific nations. High season is between April and October. As is the periods of Christmas and the New year. Flight fares peak between April and June and also in December and January. Usually take 4 to 4½ hours one way. Qantas, Fiji Airlines' Fiji Airways, and Pacific Blue are your carrier options. Prices can vary anywhere from AU$700-$1,500 depending on season and how far in advance you book. Flights take around 3 to 4 hours. Air Pacific and Air New Zealand operate here. Prices vary from NZ$600-$1,400 depending on the season and how far in advance you book. Prices vary considerably anywhere from US$1,200-$2,000. Korea - Via Korea Air from Seoul to Nadi. London is the king of discount travel in Europe. You can expect a London to Nadi return trip to be £600-1,800 depending on the season. Prices are similar for departing from most of cities on the mainland. Expect prices to be €1,000-2,000. There are 2 main airport hubs in the Pacific, Fiji being one (and Hawaii being the other). Flights to Fiji come in the form of the main routes being, to/from North America, Australia and New Zealand. If Fiji isn't your final destination (who doesn't like idyllic holidays! ), visitors can stopover in Fiji on their way through. So if you're on a stopover or on your round-the-world ticket, make sure you stay at least a couple of nights. However, I'm willing to bet you would want to stay longer! 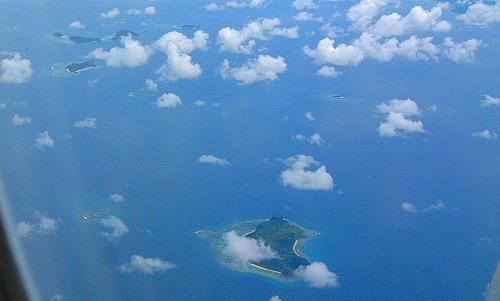 It is also possible to enter Fiji by sea via a cruise to Fiji or by yacht, although not as common. There are 2 International airports in Fiji, both on the main (and largest) island of Viti Levu. Most airline visitors will arrive at Nadi International Airport (NAN). Nadi airport (Nan-di) is just 9km from the township of Nadi. This is quite handy as Nadi, on the north-west side of Viti Levu, is the hub to get to the popular island groups of Yasawa and Mamanucas. You will be greeted with big smiles, friendly bula's, and of course the mandatory warm weather. A band might come around singing island music and welcome you by putting a flower necklace around your neck. The airport is relatively small so you'll be off to your designated transport in no time. Their security is also very relaxed as I once accidentally bypassed the luggage scanning machines without anyone noticing! Visit the Fiji Tourist Information section for more including what to bring and what you need to enter Fiji.